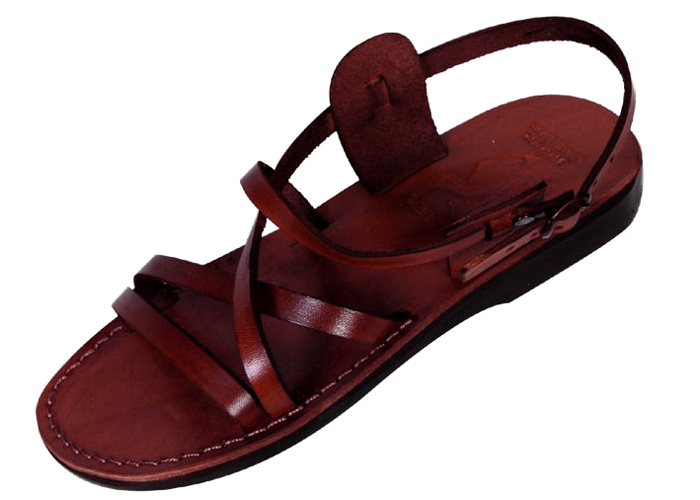 Trendy biblical-style sandals of 100% real leather. Feel the soft lining and flexible sole, the biblical sandal experience at its best. The Hermon style leather sandal has been a favorite in Israel and abroad for years, with its funky but understated criss-cross styling that utilizes four narrow strips of leather. A single piece crosses the toes, while a second strip of leather angles over the wearer's instep from the ball of the foot to halfway between the little toe and the heel. The adjustable ankle strap is formed from two longer strips of leather that buckle together, crossing the diagonal piece to form an X. Every leather sandal in Camel Sandal's collection of biblical sandals is built to last. Many of the styles are inspired by leather sandals that archeologists have discovered at sites in Israel. These leather biblical sandals are sturdy and comfortable enough to wear in almost any situation, from hiking to a casual night out. All of Camel's leather biblical sandals are handmade in the Holy Land by skilled craftsmen. The leatherworkers stitch and glue the fine leather uppers to natural rubber soles by hand. All of the styles can be ordered in men's, women's, or children's sizes. Israel Catalog is proud to offer our valued customers these fine handmade sandals.